The End Time is a theological blog posting new content every day. The photos used are either the author's own, creative commons/public domain, or via photographer's permission. All writing on this blog, except otherwise noted, (and guest posts are rare) is written by me, Elizabeth Prata. Why The End Time? This momentous period between Jesus' ascension and His return is the end time spoken of in the Bible. We are in the end time now, and the time is short. We must recognize that the time is short, and live each day loving and proclaiming Jesus with all our heart, mind, strength and soul to those who live in the darkness of sin. The time is drawing near. It always has been. I pray this blog reflects His glory, because what is on here is gained through wisdom only from the Word and only illuminated by His Spirit. Though I have taken many online doctrine classes, I have no degree in ministry or theology. I have no wisdom of myself and nothing to say except through Him. The world has been blessed by the appearance of Jesus Christ, His salvation given to His elect, and the promise of His return. In light of these beauteous facts, I write, focusing on the topics of encouragement, discernment, and prophecy. If you feel inclined, please visit my personal blog The Quiet Life. The doctrinal positions I hold mirror those found on John MacArthur's Grace To You website. I am a saved, baptized, faithful attendee of North Avenue Church in Athens, Georgia. As important as this blog is to me, my first priority is to my church family and its ministries. Hi Elizabeth, What do you know about David Limbaugh and his book Jesus on Trial ? I usually check your site daily to keep up on discernment questions. In Crist Larry R.
Thank you for reading the blog, and for your question. I'm not familiar with Limbaugh's book, though as I'm sure you noticed, the reviews on Amazon'com are stupendous. When I searched a doctrinally solid bookstore I know (meaning, they only sell doctrinally solid books therefore I tend to trust it, UNLIKE LifeWay), the search result came up with a another book with the same title. It's by pastors I'm familiar with and I do trust. Might be interesting to buy both books and compare. I sent a Google Hangouts chat invite because I wanted to ask a question, but I will ask here. I came across your blog from Michelle Lesley's website. I don't even remember how I got there. Here is my question though...who do you believe are sound teachers? So far, the articles I have read all mention false teachers and what/who you don't endorse or support. It just makes me think that no one can be trusted. Thanks for visiting! It is no surprise you came from Michelle's site, because she and I have similar sites. She does a lot of theology, encouragement, and also discernment, pointing out false teachers, like today's essay about not being able to recommend Christine Caine. Or last week's essay about not being able to recommend Kay Arthur. If you're reading only articles pointing out who I don't endorse, you must be specifically looking for that aspect of my ministry, which covers encouragement, prophecy, and discernment. Over the last two weeks I have not written anything specifically about teachers I don't endorse. That said, part of the Christian walk is discernment. It isn’t optional. It’s a command. So please, I am not trying to be disrespectful when I am going to say lovingly but firmly, when you read Michelle Lesley’s blog or my blog or any blog, if you are so easily swayed into thinking there aren't any teachers that can be trusted, you are like as the Bible says, a child at risk for being "tossed here and there by waves and carried about by every wind of doctrine" Eph 4:14. Pray for more discernment. You need it. The Spirit will give it to you. To answer your question, first is a question. Have you searched the blog? The search engine is very good and it always yields up what you are looking for. Failing a search, here is a link to a long list of women teachers I specifically listed as solid, plus one more in a separate essay. Finally, you can take it to mean I endorse a male teacher if I quote him in an essay. so that should more than answer your question. There are many false teachers out there, who you should NOT trust. Be discerning, wise as a serpent and gentle as a dove! Thanks for answering. I realized after I sent the message that I haven't searched your blog enough. I apologize for that. No worries. And you're certainly welcome. Thank you so much for your discerning thoughts on David Jeremiah's error in teaching. I have been a follower of some of his writings and sermons for some time now but have had some issues with some of the statements he has made which seem to indicate a false theology. (even as it appears to be mixed with statements that contain truth...very dangerous concoction) My doubts actually started with DJ's obvious endorsement of TBN...?? But you also have pointed out what also concerned me the dramatizations and the attraction of Hollywood-ism.. I have been financially supporting Turning Point Ministries for years but now wonder if this is what I should continue to do or should I direct my support to a different ministry? How do discern the will of God as an autistic woman? I'm autistic too. It actually makes things easier. The will of God is to repent & believe, be baptized and participate in communion, and obey Him all your life. We know how and where to obey in life choices because we read the Bible. As far as day-to-day choices go, like where to live, what college to go to, whom to marry or whether to marry, the more we obey the more we're conformed to Him which means the more we can confidently decide for ourselves, knowing God prevents bad choices and ordains all things, AND makes all things work to the good of those who love Him. This is where trust comes in. Here is GotQuestions with a short answer to 'what is God's will? "Taking the Mystery out of God's Will"
At the website of the Covenant Protestant Reformed Church there is a list of all the languages and the materials they have in each language. this is the page for Polish. They are mostly the creeds. ‘Legatio’ is the name of a Christian publishing company producing books in the Polish language. It was set up in May 1997 on European Missionary Fellowship’s initiative, to start a national and independent organization to publish good Christian literature. Polish brethren received that offer of help with great enthusiasm and the new set-up brought out its first book in September 1997 – Losing Touch with the Living God by John Benton. The need for Christian literature in Poland has been inspiring Legatio for eight years and has resulted in 40 titles translated from English into Polish and published. Hi Elizabeth. Could I ask one favor? In the subject line in the daily emails from you, could you add a few words that describe what the email is about? Presently, each day's subject line is the same: The End Times. If you could expand it to, for example, "The End Times - Anita Bryant", then I could review an older email and find one that I want to reread, or forward to another friend. You asked a really good question. It reminded me to go back and check some things I'd set up years ago and refresh. In the technology world I can't "set it and forget it." I haven't really looked into updating the blog to ensure compatibility with mobile phones (not as much of a problem when I started in 2009), nor have I tended the email feed lately. I went over the feed subscription customizations and as far as I can tell, there is not a way to customize the email title. The ones you receive from the subscription are not from me, they are automatically sent out by the Feed app. I recently set up a mirror blog on Wordpress (In case Blogger decided to delete my blog for the Anita Bryant essay, or suspend me for 'hate speech' or something). Wordpress allows a bit more customization. I work in a public school, so I will have time to look into that in two weeks or so when school is out and I am home for the summer. WP allows more customization but there is a steeper learning curve- hence needing time. But I promise I will look into both WP and Blogger to see if there is anything I can do to customize the feed titles. It is a good question. when they come to a subscriber. Anyway, thanks Jack. Your query spurred me to do some clean-up work on the blog's background stuff. Thank you for the question and for reading the blog. I appreciate it. I poked further and I might have found the solution you asked for. I hope it works! I'll keep trying! When I want to review a blog from a subscribed source, I forward it to myself and give it a revised subject so I can find it again later. Since you are not allowing comments on the page about Joanna Gaines four minute video on the blog about her I wanted to pass this information along. I have conducted numerous on camera interviews and am very good at editing which brings me to the point. The interview Joanna gave was likely 20 minutes or even an hour long. The four minutes in the finished product was what the producer wanted to show. You have no idea what other things Joanna said that was cut out. As all digital and print media goes, the producer has a bent or a theme they are wanting to stick with. What you saw in those four minutes is what the producer wanted the audience to see...what he thought was important, or what he thought would reach the most audience, or what he thought would market best, or what he thought was most palatable. We have no way to truly know who Joanna is. We only get a glimpse of what people want us to see. Thank you for your comment. I published it because you raise a good point about editing. I am also an editor, I have been for the last 15 years and not just on this blog. The point regarding editing is on the one hand, you're right, personas can be shaded through editing. Just look at Project Runway or Hell's Kitchen or The Apprentice or other reality competition shows where a 'villain' and a 'good guy' is needed. Editing helps accomplish that. My point regarding editing comes from the Christian side. I am not interested in what was left OUT through the editing process. I am reviewing what was left IN. For my point, it is enough. (And I did not rely on one source alone.) Joanna Gaines claims to have had specific direction from God Himself. This is an important event if true, it means that God is still speaking and Joanna is a prophet. However the Bible says the canon is closed and He is NOT still speaking. All I needed to read were Joanna's multiple and credibly reported statements from a variety of sources (not only one video) to know that she claims to receive specific and personal direction from God and therefore know she is not telling the truth. She is either lying, misrepresenting God, or hearing from a demon. Those are the ONLY options, in the Christian, not editing, world. Since this issue (hearing from God, personally, audibly no less!) is such a huge issue to Christians, it bears heavy weight in assessing her testimony and therefore her entire Christian credibility. May I please ask from which link did you hear about the essay I'd written? From whence have you come? Thank you for both the comment and visiting here. PS: I re-opened commenting on the essay to wwhich you refer. It is an older essay and comments had dwindled, the only ones I'd occasionally receive were ad hominem attacks for "daring" to say something negative about the Gaines' However it seems the piece has been linked-to somewhere and I'm getting several thousand visitors a day to it all of a sudden. So, I reopened comments so as to hear from people, explain biblical stances, and share the Gospel. Do you offer an email newsletter? Have you perhaps had a look at www.areyouready.co.za? I looked at the site. Thank you for thinking of me and sharing. I do have a heart for the rapture and the things to come, you're right! However the site dates the rapture and uses uniblical divination etc.. . so I don't recommend the site. I really like your blog and find all your arguments valid and make sense. I was actually one of those people who can easily swayed by highly intellectuals teachers and apologists and so when I found out your blog about Ravi I was astounded but enlightened as well. And so I want to thank you that now I have learned to really study and filter every good teacher/preacher that's coming my way. And with that, there is this woman author that I have stumbled from a chrisitan bookstore that I went to and because the book was on sale and the title was interesting I bought it. But I couldn't find the name anywhere here in your blog. I wonder if you have heard of her, Danna Gresh? Her books are all about women, singles and Christian dating. Perhaps you can give insights? Also, I haven't got a chance to really explore your blog so I will just spill it here. I wonder what would be your insight about the novel series "The Left Behind"? I love reading novels of any sort and so this series just like any other fictions is actually part of book collection but I just found out recently some negative criticisms about it. Thanks for your comment. I am not familiar at all with Dannah Gresh. I looked her up. It seems that her ministry is promoting the sexual purity of the Christian, especially girls & women, (to whom she specifically ministers). I read her Wiki, her web page, someof her blogs, looked at her books, and watched an interview, and it didn't seem like she was saying anything to be wary of. It all seemed good. She has a ministry which promotes biblical roles for boys and girls, men and women, moms and dads, and stresses sexual purity. She also didn't seem like she went over the line to legalism and undue rule-making and breaking, just stuck to the biblical standards. With that very! superficial assessment, I'd say give her a go, and as always, use your own discernment through biblical knowledge and prayer. Left Behind. Where do I begin. I think the books are fine (with one caveat). Left Behind are a series of 10 books written by Jenkins and LaHaye, which seek to illustrate according to the Bible, what the period known as the Tribulation (wrath of God) will be like. The authors novelized the Rapture and the subsequent Tribulation period to bring to life the reality of this overlooked and maligned section of eschatology, or 'last things'. Catholics and Orthodox: they do not like the book because they do not believe in the rapture. That's OK, they don't believe in the God of the Bible either, so we can ignore their criticisms. Premillennialists: These are people who adhere to a segment of eschatology that believes the rapture WON'T happen before the Tribulation. The Left Behind authors hold to the co Premills believe that Jesus will literally return to the earth before (pre) the millennium begins. So we can dispense with the premills' criticisms. Post-rapture and no-rapture crowds have the same criticisms. None of the three camps have biblical validity, therefore, ignore. Eschatology-dissers: This is a term I made up just now, lol. This is a segment of theologians who condescend about all things last things. They believe it isn't a worthy area of study. Some of that negativity surrounding prophecies etc have merit, and we’ve done that to ourselves. We know if it is in the Bible it’s there for a reason and God wanted us to know about it. But decades of date-setters and false prophets claiming to have gained personally delivered divine insights as a result have jaded people and brought disrepute onto God’s glorious prophecies. Some of the criticism is that the Left Behind series “date-sets”, which it does not. The authors never set dates, they just novelize what the Bible says about what will happen in the future. Others claim they engaged in “newspaper exegesis” which is to look at prophecy through current news and claim to have insights as to near term fulfillments. The authors never did that either. So we can ignore criticism based on eschatology dissing, date-setting, and newspaper exegesis. I said I had a caveat. I actually have three. First, I read the series when I was a babe in Christ. I didn’t detect any wrong theology at that time. But then again if I re-read the series now, I might. So be careful. Eschatology seems to attract a weird crowd these days. Second, the Tribulation will be the most horrific time that will ever occur on the earth, and that is a promise from Jesus Himself in Mt 24:21. It will be hell on earth, untold and unimaginable horrors, as God lets sin overtake the earth FULLY. However I found the books to be quite sanitized. If the authors sought to being terror to the heart in relating what it will be like to endure God’s wrath, they failed. They made it seem more like an adventure than a horror. More like an inconvenience than a monstrosity. However, I acknowledge that the real horrors of the Tribulation really cannot be told. If they did, they’d be violently pornographic, so I understand the restraint the authors limited themselves to. 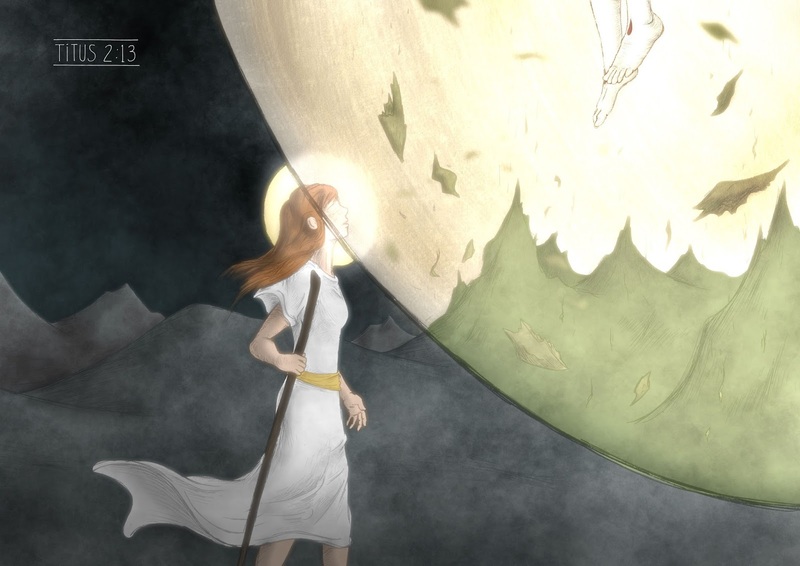 But just be aware that the Tribulation won’t really be like they depicted. It will be a gazillion times worse. Third, please note that Tim LaHaye is an avowed anti-Calvinist. I dont' know if he was one before he wrote the books or became so anti-Calvinistic later. Calvinism is biblical, so that is a strike against the author's theology. In the long run, I found the Bible the most helpful on understanding last things, like the rapture and tribulation and second coming. Novelizations just can't do the topic justice, so why monkey around with it when the Bible is available? In addition, Quality commentaries on the bible's eschatological passages are around, too. I don't think the Left Behind books will do you devastating harm, but not a lot of good either, but they WILL instill in you a picture of the Tribulation that just doesn't measure up to how it will really be. Which is kind of harmful in itself, though no one can rightly picture what an earth full of sin & God's anger will be like, completely. If you want to read a quality, solid book on the Tribulation that will make your heart stop in fear (because it’s biblical, not because it’s sensationalized) read John MacArthur’s “Because The Time is Near” a quick explanation of the book of Revelation. Your heart will be in your throat and you’ll want to go out and witness to everyone you see, which is what prophecy is supposed to make us do, because, ‘the time is near’. Wow, I am shocked and dismayed about the negative critique of the Left Behind series. It is FICTION and never promoted otherwise. Readers of all backgrounds choose Fiction based entertainment for thought provocation NOT for actual fact finding. I personally found it to open minds of those who might not ever otherwise take the step to open a bible but this series, written in it's captivating manner, instilled a curiosity and a yearning to find out the real story in the bible. It is a fictional piece of work that inspired me, captured my attention and became the driving force in finding out what is contained in the Holy Bible pertaining to this subject. What a better way to reach the unreachable than to tell a riveting story that would encourage the desire to seek out the truth. Without it I would not have sought out truth and be as far along in my faith as I am today. Hey! I have been reading some of your articles pertaining to the Pentecostal movement and I was just inquiring of why you think that spiritual gifts have stopped? I am not trying to start an argument or anything, I simply want to hear your perspective on it. Thanks! I don't think the spiritual gifts have stopped. Not all of them. Only tongues, healing and miracles; the sign gifts. Thanks for asking! Here is the perspective on why those "sign gifts" (but NOT the others) have stopped. Are the miracles gifts for today? Elizabeth, thank you for clarifying C.S. Lewis' lack of or no theology in one of your recent blogs. I've never been drawn to read his books; maybe the Holy Spirit was protecting me.